This species is accepted, and its native range is Tropical Africa to Swaziland, Comoros, Madagascar. Annual; culms 30–110 cm. long, erect or trailing. Leaf laminae 6–15 cm. long and 10–15 mm. wide, lanceolate, membranous, flat, cross-veins present, acuminate. 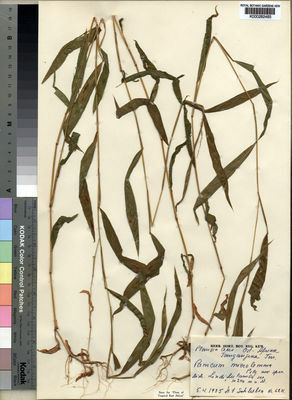 Panicle 12–30 cm. long, oblong, moderately branched, the secondary branches usually appressed. Spikelets 1.8–2.2 mm. long, oblong, glabrous, obtuse; inferior glume 1/4–1/3 the length of the spikelet, ovate, cuff-like, hyaline, 1-nerved; superior glume 3-nerved, membranous, obtuse; inferior lemma 5-nerved, its palea absent, sterile; superior lemma and palea pallid, glossy, minutely scaberulous, the lemma with a green spot at the apex. Annual; culms 30–100 cm. or more long, slender, decumbent or erect. Leaf-blades spreading, lanceolate, 6–15 cm. long, 10–15 mm. wide, slightly asymmetric at the base, thin, cross-veins numerous, sparsely pilose, acuminate. Panicle 12–30 cm. long, oblong, spreading or contracted, sparsely branched, the secondary branches usually appressed. Spikelets oblong, 1.8–2.2 mm. long, blunt, glabrous; lower glume cuff-like, 1/4–1/3 as long as the spikelet, hyaline, 1-nerved, obtuse or acute; upper glume as long as the spikelet, membranous, 3-nerved, obtuse; lower lemma 5-nerved, sterile, its palea absent; upper lemma pale, shining, minutely scaberulous with a tiny green spot at the tip. Annual. Culms erect, or decumbent; slender; 30-100 cm long. Ligule a ciliate membrane. Leaf-blade base asymmetrical. Leaf-blades spreading; lanceolate; 6-15 cm long; 10-15 mm wide; membranous. Leaf-blade venation with distinct cross veins. Leaf-blade surface pilose; sparsely hairy. Leaf-blade apex acuminate. Inflorescence a panicle. Panicle open, or contracted; oblong; 12-30 cm long; contracted about primary branches. Spikelets solitary. Fertile spikelets pedicelled. Spikelets comprising 1 basal sterile florets; 1 fertile florets; without rhachilla extension. Spikelets oblong; dorsally compressed; obtuse; 1.8-2.2 mm long; falling entire. Glumes dissimilar; reaching apex of florets; thinner than fertile lemma. Lower glume oblate; 0.25-0.33 length of spikelet; hyaline; without keels; 1 -veined. Lower glume lateral veins absent. Lower glume apex obtuse, or acute. Upper glume ovate; 1 length of spikelet; membranous; without keels; 3 -veined. Upper glume apex obtuse. Basal sterile florets barren; without significant palea. Lemma of lower sterile floret similar to upper glume; ovate; 1 length of spikelet; membranous; 5 -veined; obtuse. Fertile lemma oblong; dorsally compressed; 1.5-2 mm long; indurate; pallid; shiny; without keel. Lemma surface asperulous; rough above. Lemma margins involute. Lemma apex obtuse; with a shallow excavation and with a green spot. Palea involute; indurate. in Engl., Bot. Jahrb. 57: 185 (1921). Clayton in Flora of West Tropical Africa, ed. 2, 3: 434 (1972). D.M. Napper, Grasses of Tanganyika: 60 (1965). F. W. Andr., The Flowering Plants of the Sudan 3: 497 (1956). Mez in A. Engler, Botanische Jahrbücher für Systematik, Pflanzengeschichte und Pflanzengeographie 57: 185 (1921).